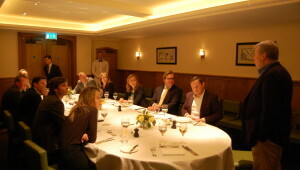 To Boulestin, St James, for a much anticipated lunch in their private dinning room. Opened just last year, this is a venue with such a classic feel that it seems to have always been there, and long may that continue because we will certainly be returning. Welcomed by proprietor Joel Kissin our assembled guests were treated to three courses of the most classic French cuisine in an intimate private space below the main dining room (quite special, just ask to be shown around when dining upstairs). Hidden behind intriguing solid oak doors which achieve both an imposing and welcoming affect, the PDR gives guests the sense of intimate exclusivity; a perfect space for when a dining occasion requires that little bit extra. Murano Connect, our co-hosts for the occasion, were on hand to greet attendees who came from across the alternatives spectrum. As always at our private dining occasions, each guest was afforded the opportunity to talk to the room about their current interests, projects and how they had arrived there. Not only does this set the scene for a vibrant discussion on the day, but it allows all to see where the most beneficial connections in the room are. Platforms, national pension funds, established funds and start-up managers all spoke about what they’re looking for right now as we started with what was to be the first of three exquisite courses. A choice of Pan Fried Scallops with Ceps and Jerusalem Artichokes or Game and Foie Gras Terrine, to kick off, set a tone which was not only matched but bettered at each course. Throughout this was cooking that remained familiar yet exciting, comforting yet new. The warming amber glow that pulls one in to Boulestin seems to have somehow been added in the cooking too. Roast pigeon with kale and girolles followed, with optionality to call on wild sea bass with braised fennel and sauce vierge if the pigeon didn’t fly. All puns aside, both were classic, accomplished dishes. Switching seats after our main course, to mix the connections up further, coincided with switching gears too. Up, and into desert. Whilst the first two courses were exemplary, to a man we found them mere introduction to what followed. The sauternes custard with plum compote sang, from first mouthful to last and the blackberry tart with crème fraiche was in quick and full bodied support. It has to be said though that those who missed the custard and tried the sauternes were aching with jealousy and keen to return for that alone. Too bad they don’t serve it at breakfast – was the only complaint we could arrive at. Kissin, long since one of the most influential restaurateurs in Britain, launched Boulestin in 2013. Inspired by French restaurateur, author and pioneering TV presenter, Xavier Marcel Boulestin (whose original restaurant was born in Covent Garden in 1926), the restaurant has received high praise since. Being in the heart of one of London’s hedge fund districts it’s firmly on our map as an excellent venue for breakfast, lunch and dinner alike. We thoroughly recommend and will be returning for both work and play as soon as we can.